Get a bony, bonny look for your next Halloween! 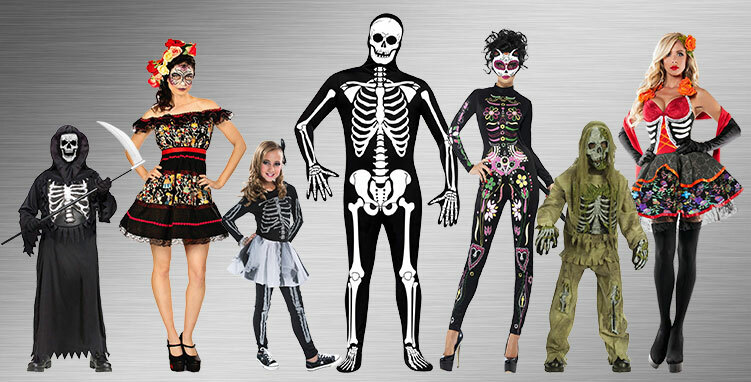 Become one of the classic monster types you can always see prowling the streets for candy and scares, or make an appearance at your next costume party with looks like an X-Ray skeleton, formal skeleton, skeleton queen, a disappearing skeleton man, and lots more, for kids and adults! You’d have to go digging up graveyards to find more skeletons than what we have crawling around here. And don’t make the mistake thinking all skeletons are just a pile of bones. Once you see the variety of boney creatures you can dress as, you’ll be sure to find a costume to match your personality. 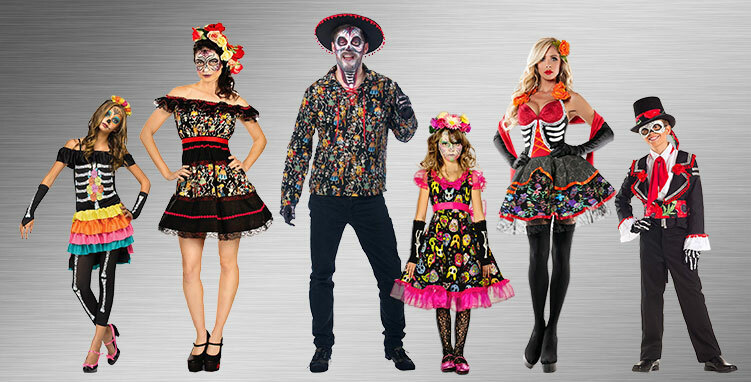 From decorative Day of the Dead costumes to cute and flirtatious outfits that will make the living envy the dead, we have something for everyone. Even the kids can step into a ghoulish guise and haunt the neighborhood for the evening! Who said being a skeleton means you can only dress up in drab and dingy clothes? This Funky Punk Skeleton Child costume proves that being part of the dead crowd can be even more fun and vibrant than when living. The neon rainbow dress brings color to the dreary underground scene. The neon bones on the shirt, the tights and sleeves add an anatomically correct punch to any skeleton’s world. Bring out the chess board and hide your loved ones! Death, also known as the Grim Reaper, has come for his harvest. This classic horror costume includes everything you associate with the Grim Reaper, including a long, torn black robe and exposed bones. The most unique feature is the glowing chest cavity, which is complete with a beating heart that lights up with three AA batteries. When the lights go out, unsuspecting victims will see the skeletal terror glowing before them! If you’ve been searching for a way to help your kid stand out among all the other creepy skeletons out there, look no further than this unique morphsuit. With an artistic design that reimagines the human skeleton, this spandex suit covers the entire body with exciting graphics. Durable and easy to put on and take off, this morphsuit features an attached hood and a seamless zipper system. Put a little Dia de los Muertos flavor into your Halloween with this funky skeleton costume. Will it look like a real skeleton exhumed from the grave? No, but you will get a lot of laughs with this gag costume! And since no one will recognize you, feel free to run amok. There’s no need to pile on the make up or match your clothes, as you can just step right in, zip up and head out. Here’s a whole new take on the phrase “teenage wasteland.” If your teenager is raiding the fridge at night, hunting down brains and sleeping in their grave until the afternoon, they’ll be sure to fit right in with this elaborate undead guise. Featuring a super-comfy mask that goes on and comes off with ease, it’s paired with a torn and ragged shirt and pants, plus a pair of gloves that really shows off the knuckles. This form-fitting Day of the Dead: Sugar Skull Cat Costume for Women outfit hugs the body to give a sleek look that will be unique to each wearer. With a colorful pattern inspired by a traditional design, this costume can be worn well after the day of festivities has ended, providing fun, creative energy to any wardrobe. The artisanal cat mask conceals your identity as you make your mischievous rounds. A national holiday in Mexico, Day of the Dead has spread throughout the world and is now widely celebrated in the United States. Commemorating and honoring those who have past, it also serves as a reminder to the living to celebrate and enjoy life. To help you do just that, we have a wide variety of costumes to help color your celebration, from traditional kids’ outfits to modern takes on traditional designs for adults. Odds are, we at BuyCostumes have just the outfit to complement whatever you have lined up for your Day of the Dead celebration. For the siblings who insist on terrifying everyone they meet, these costumes will transform them into the harbingers of death. Maybe that’s not an easy way to find a babysitter for the night, but they do make for a great Halloween costume! 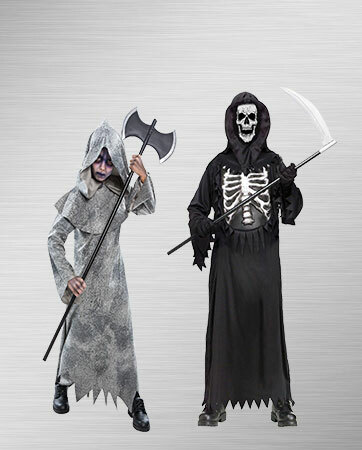 The Grey Skeleton Reaper Robe is neatly trimmed and comes with a full-sized hood. The Glow Chest Reaper costume uses three AA batteries to get the ribcage glowing and comes with a black robe and mesh mask. If you and your boo are looking for a way to win the prize for best-looking couple, there’s no need to dress up in pearls and Italian suits — we have the outfits no one will forget! The Dead Man’s Party costume is simply one of the most unique shirts out there, colored by amazing dancing skeleton graphics and a lace-up front closure. The form-hugging Sugar Skull Cat costume has an equally amazing design and artisanal mask. Just because there’s no flesh on these bones doesn’t mean family is unimportant! 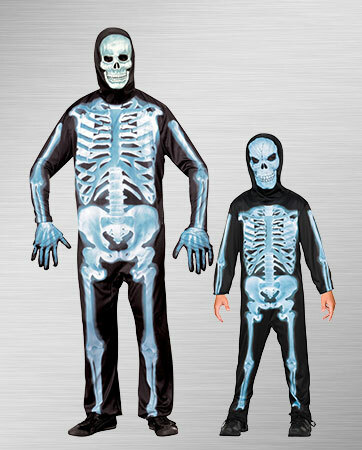 This pair of x-ray skeleton costumes will make father and son, mother and daughter or any combination in between into a family of happy dead. 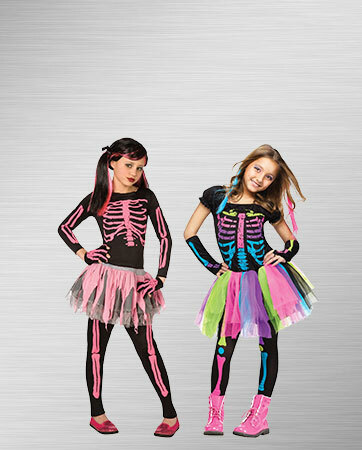 Both the child and adult costumes come with a jumpsuit featuring a fully illuminated skeleton and a skull mask. We guarantee none of the bones are broken! The punk scene has gone underground — literally! Skeletons aren’t interested in dressing up and impressing high society; they’re all about flaunting society’s conventions, and they have fun doing it. 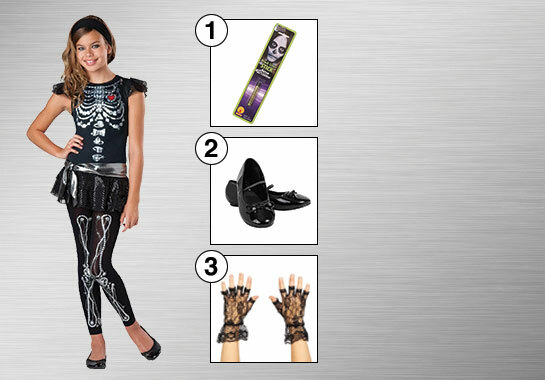 In light of this, we have the perfect outfits to complement your little skeleton punk. Each costume features a colorful gossamer dress along with tights and a shirt, which features brightly colored ribcage, femur and more! 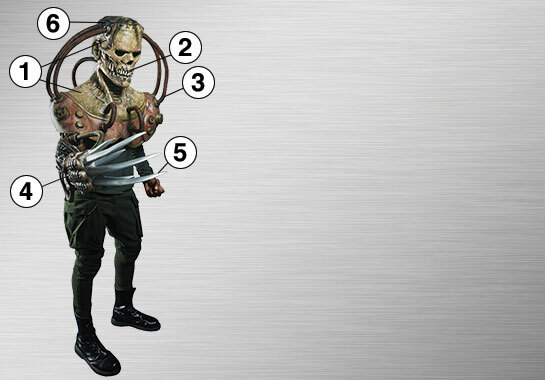 From the creative mind of the legendary master sculptor Mario Chiodo, the Nightmare Collection’s Steampunk Frankenstein is a masterpiece of costume making. The oversized mask piece features patchy, stringy hair that will disgust the most diehard horror fan. The head, with detailed facial features, hooks into tubing that connects to the larger shoulder piece. The nightmare marriage between machinery and flesh is gruesomely realized in the highly detailed claw where wire and metal animate the dead arm. Hand painted with meticulous detail, if you’re looking for a costume like no other, you’ve found it. Who says there’s no glamor in the life of a skeleton? If you have a ‘tween at home who has some glamourous ideas about what a costume should be, the bling and sparkle on this costume will satisfy even the most diamond-hungry of girls. For the full glamorous look, check out the black liner makeup stick, an easy way to paint patterns and character features on her face. For her feet we have the Black Ballet Flats, because even a skeleton needs to dance. Finally, to be the trendiest among the dead, check out the Black Lace Fingerless Gloves for that little bit of extra flare.